A great communication and assessment tool. 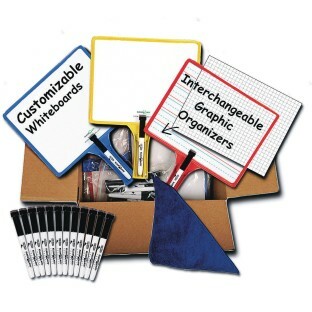 This set of customizable whiteboards with dry erase sleeves is a great communication and assessment tool. Includes: 12 all-in-one, hand-held whiteboards with dry erase sleeves, 12 double-sided graphic organizers (lined/graph),12 dry erase markers with eraser caps, and 1 microfiber cleaning cloth.